Designer style meets practicality in this plug-in swag chandelier. 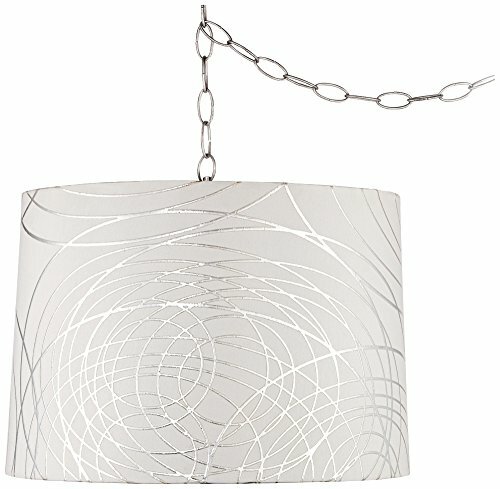 The design features a designer off-white shade with abstract silver circle pattern, and comes with a brushed steel finish canopy and chain. In-line on/off switch makes it easy to control. - Shade is 15" across the top, 16" across the bottom, 11" high x canopy is 5 1/2" wide, 1" high. - Uses one maximum 60 watt or equivalent bulb (not included). - Includes swag hooks and mounting hardware, 13-foot cord, 9-feet of chain. - Off-white shade with abstract silver circle pattern. - Brushed steel finish canopy; chrome finish spider fitter. Shade is 15" across the top, 16" across the bottom, 11" high x canopy is 5 1/2" wide, 1" high. Uses one maximum 60 watt or equivalent bulb (not included). Includes swag hooks and mounting hardware, 13-foot cord, 9-feet of chain. Off-white shade with abstract silver circle pattern. Brushed steel finish canopy; chrome finish spider fitter. If you have any questions about this product by Universal Lighting and Decor, contact us by completing and submitting the form below. If you are looking for a specif part number, please include it with your message.